New Huddersfield Town manager David Wagner wants to bring an attacking style of play to the Championship side. Wagner, 44, replaced Chris Powell last week and watched Saturday's 3-0 home defeat by Leeds United from the stands. The former Borussia Dortmund coach said he was keen to develop Huddersfield's younger players into a more attack-minded squad. He told BBC Radio Leeds: "When the board explained to me what they wanted, it was exactly what I stand for." "I liked the game I played before at Dortmund. The game was speed and passion," he added. "I think the mentality of this squad is very good. What we will try to do is open their mind and then we can create something new." Huddersfield have won just three of their 16 league games so far this season, leaving them 19th in the Championship. 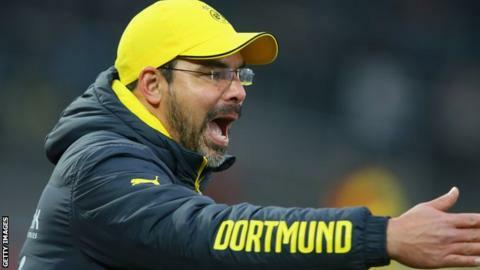 Wagner worked with Liverpool manager Jurgen Klopp at Dortmund and said he would bring a similar playing style to Town. "We have known each other for more than 25 years and we've spoken about football for 25,000 hours," he added. "What is 100% similar is the style of game we love and the style of game we stand for. This is where you can compare us."